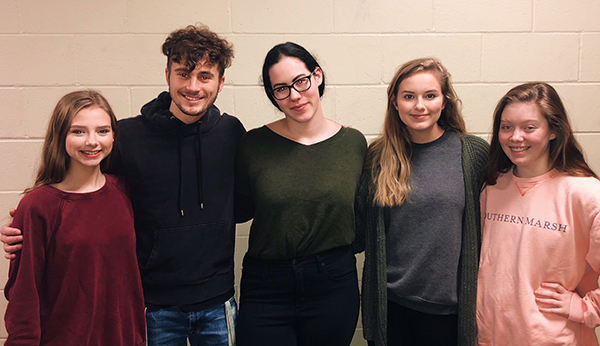 Texarkana, TX – Texas High School Tiger Theatre Company Troupe 2526 participated in the Texas Thespian Festival during November in Grapevine, TX with four students earning top ratings. Addison Cross and Andrew Davis (Duet Musical), Cate Rounds (Solo Musical) and Nadia Fryer (Stage Management) received Superior Ratings. All are now qualified to compete at the International Thespian Festival in Lincoln, NE during June 2019. Shelby Steele was one of sixteen students selected as a 2019-20 Texas State Thespian Officer. She will work with fellow officers in planning, hosting and managing the State Leadership Program, Junior Thespian Festival and Texas Thespian Festival. The Texas Thespian Festival is a state-wide festival, open to any active Texas Thespian Troupe. Considered one of the biggest theatre festivals in the United States, the Texas Thespian Festival 2018 had over 7,000 students attend for three full days of educational theatre workshops, performances, auditions and professional guest instructors. There are over 500 troupes throughout Texas focusing on promoting excellence in middle school and high school theatre departments.